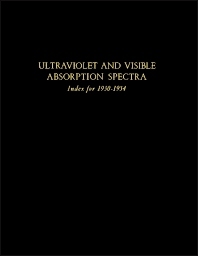 Ultraviolet and Visible Absorption Spectra, Index for 1930-1954 is a reference volume listing of ultraviolet and visible absorption spectra in the literature. This book contains about 32,000 references to published absorption spectra in 27 important American and European journals and one book. The index is arranged according to the compounds whose spectra are given. The indexing arrangement is roughly similar to that used in Chemical Abstracts, although it has not been practical to conform to Chemical Abstracts nomenclature throughout. Wherever possible, all references for a particular compound have been listed under a single name, but there will be some instances where listings for the compound may be found under several different names. The rules used by Chemical Abstracts have been followed where practical, but some inconsistencies will be found. Researchers in the fields of organic, inorganic, and analytical chemistry will find this Index a great value.